The Embroiderers' Guild of Peterborough took part in National Stitch in Public Day on September 27th., with a coffee shop crawl in downtown Peterborough. 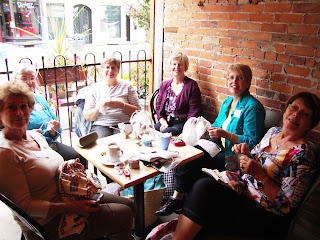 Members met at the first coffee shop at 9:30 a.m., drank coffee, and stitched. Several other coffee drinkers were interested in what we were doing, and one young lady working in the coffee shop thought she'd join us after her shift. We stitched and drank coffee in five different coffee shops until 4:30 p.m. All of us thought it was a great way to spend a day. We spoke with several interested people throughout the day, and we felt that we had achieved our goal of raising awareness of the art of embroidery by stitching in public. A day of stitching, coffee, and fellowship! Take a look at this website: http://lcsg-gtal.ca/ Way to go Lakeshore Guild a wonderful site. I like it, and you will too!